I have felt some resistance to writing this race report. Based on the pure result of my race, I am thrilled. A 32 minute improvement on my Personal Best (PB) on a (slightly) more difficult course after a less than ideal final prep period is a great result. Unfortunately, I have been diagnosed with a moderate case of EAOCD (Endurance Athletics Obsessive Compulsive Disorder). This means that no matter how fast I go; it is difficult for me to enjoy the result. I am always looking for some way I could have gone faster. I will also attempt to document my version of the “dark-side” of this, but for now, I will focus on the positive. Thanks in advance for taking the time to review my on-line post-race therapy session. My wife, Debbie, and I attended this race without our children. This was the first time for us. 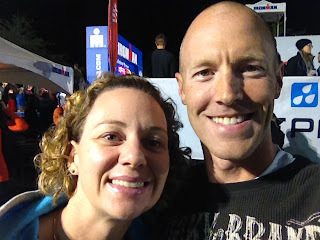 It was great to be able to experience this race with my wife and allow her to focus on herself and enjoy the race. Generally, she is the “Iron Team Captain” and spends a lot of time/energy caring for our two children while I am racing. This would not have happened without Jerry and Pam Sauer agreeing to care for our children for the three days we were gone. Thank you Jerry and Pam!! 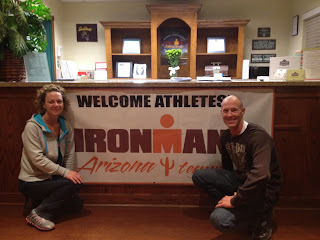 Ironman triathlons are a challenge in logistics. These are generally races that take at least a year of advance planning and training. The ultimate event logistics begin at registration two days prior to the race. There is no registration the day before or the morning of the event and if you miss the registration, you are going to find yourself in for a weekend of spectating at a triathlon. One logistic challenge is getting your bike to wherever you are going to race. One method is to take your bike apart and transport it in a bike box via plane or courier etc. The other option is a bike transport company. I have chosen the latter option for the last few races and it has worked out well. The basics are that you drop your bike off at a participating bike shop 10-14 days before your race and the transportation company picks up all the bikes and drives the fully assembled bikes to your destination. This also gives you the opportunity to have your bike shop do a last minute bit of cleaning and tuning. Given my experience with flat tires in races this year, I thought this would be a good opportunity to try a proactive measure and have the bike shop install new tubes and put a puncture repairing sealant into the tubes. After registration, Debbie and I were able to stop by the bike transport company station near the transition area and pick up a fully assembled bike. In theory, all I have to do is install my wheel covers on the back wheel, put on my racing front wheel and screw in the pedals. As we had some extra time before dinner, I thought I would get started on the bike work. Several minutes before we were to leave, I thought I would pump the tires up to pressure so I could see how much air was lost from the new tubes overnight. As the rear tire reached the right pressure, I heard a noise akin to a small caliber gunshot. Unfortunately that means that my investment in proactive flat prevention has just backfired. One quick change of tube (including sopping up a small amount of sealant off the hotel carpet) and we were off to a very nice grown up dinner. After dinner, I was able to get the rest of my gear bags organized and got ready for the next morning. The next morning we got up early for the practice swim, safety check ride and short-run. This was going to be followed by dropping off the bike and transition gear bags. Luckily for me, Debbie had agreed to go with me and watch my gear while I was performing my own mini-triathlon. If you have not raced at a specific venue and you they offer a practice swim time, I highly recommend you take advantage of the opportunity. 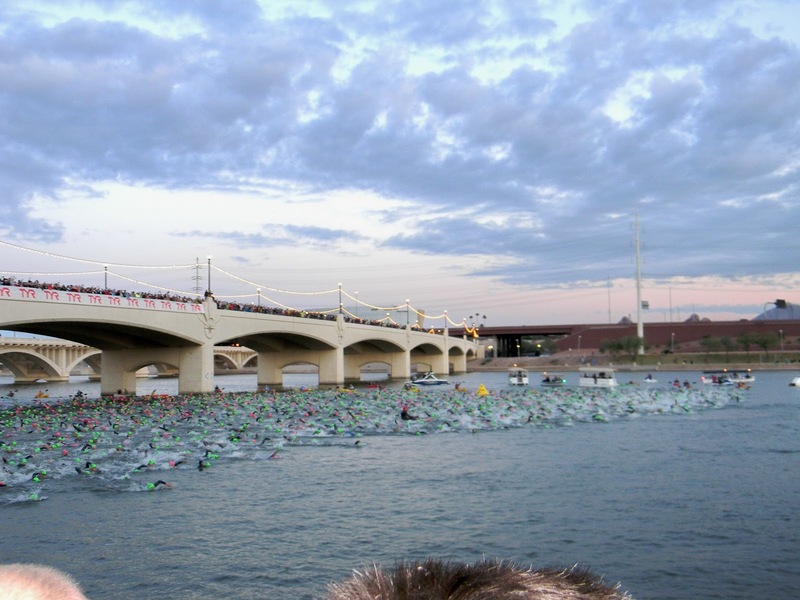 The swim for this event is held in Tempe Town Lake which is actually a dammed up canal. I had no idea that a body of water in Tempe, Arizona could get that cold. While others were debating whether or not to wear their neoprene “booties,” I put on my sleeveless wetsuit and hopped in. They only allowed you to swim in a small area of the lake, but it was nice to get a sense of what I was in for. As I exited the water, I found Debbie and got out of my swim gear. I placed my wetsuit on a fence rail to drip-dry and off I went to find the bike course. After navigating the transition area, I was able to mount my bike and roll out for a 20 minute safety check. About 4 minutes after leaving the transition area, I heard another “gunshot” and began to fume. This time my front wheel had popped, but the sealant was actually holding it together relatively well (save the large bulge out the side of the tire. I am really glad I did that safety check. As frustrating as my second flat tire was in roughly 1.2 miles of riding, I was happy it happened on Saturday and not Sunday. I changed my flat tire and turned right back around to transition. The run was uneventful. A short, out and back on the course and we were ready to drop off my gear bags. I put on my backpack and was ready to roll. We did stop by the “Expo” area and bought a couple new tubes and CO2 cartridges for the special needs bags (just in case) and then we dropped of my gear. As I stood in line for the bike/gear check-in, I realized just how logistically well put together these WTC “Ironman” races are. This particular example was that as you walk into the bike check area, they take a picture of your bike with all your gear on it so they will have a record of what your bike looked like as it went into transition in case there are any issues later. When you drop off your transition bags, it is a great opportunity to walk through the transition areas. Mentally “walking though” your race day and knowing where your gear will be in each of the transition areas helps relieve anxiety you might have about the transitions. Once we were done with the check-in, we went back to the hotel and lounged around before lunch. Just before we left, I thought it would be a good idea to make sure all my stuff was ready for race morning. As I am going through my bags I realized that my backpack is lighter than it should be. I dug in a little bit further and couldn’t find my wetsuit. I asked Debbie about it and that is when I realized I left my wetsuit hanging over the fence rail earlier that morning after the practice swim. It was now about 2:00 in the afternoon and we left the practice swim area around 10:30 that morning. We ran downstairs developing contingency plans on the fly a) there was a wetsuit dealer in the expo, b) Trisports.com has a physical store in Tempe about 5 blocks from transition and c) Inside-Out sports was also in the expo (a triathlon retailer). If I had to buy a new wetsuit on Saturday and then swim 2.4 miles in it the next morning, it would be better than trying to do it with no wetsuit at all. As I quickly walk up to the practice swim area I see an empty fence rail and think I am just out of luck. As I walk further down to where Debbie was sitting earlier that morning, I see that my wetsuit is sitting on the rail exactly where I left it about 4 hours prior. 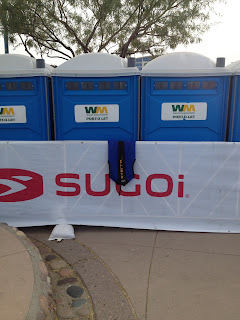 The blue of the interior of the wetsuit was a near perfect match with the porta-potties behind the fence and it blended in. There were only 3 or 4 other people around the swim area at this time, but there were hundreds that morning. The fact that it had not already become someone else’s “back-up” wetsuit is either a testament to the integrity of the others there or everyone was so wrapped up in their own deal that nobody else even noticed it. Either way, another crisis was averted and Debbie and I were off to an early dinner. I set my alarm for 5:00, but got up at 4:00 (typical). It was a good thing I got a good night’s sleep the night before. Our hotel had arranged for us to have “to-go” breakfast bags so we were ready and rolling by 5:30. The energy in transition area is amazing. Most people are busily going about their routine. There are a few that look frantic and appear to be ready to “pop” at any moment, and there are a few people that look like they could be meditating in a yoga studio. It is a very interesting mix and when you consider there are 2000+ athletes all trying to get ready in the same spot, it is amazing that more things don’t go wrong. For me, the only thing that did not go according to plan was that I had forgotten to re-pack my bodyglide into my wetsuit bag after the fiasco that happened the afternoon before. I was not looking forward to wetsuit chaffing, but it was not the end of the world. 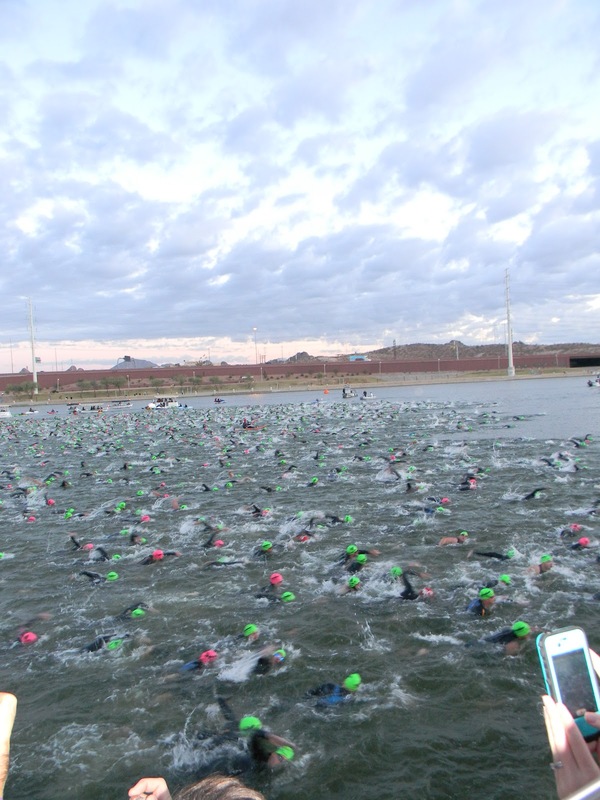 The race organizers announced that the water was 64.6 degrees and “booties” would be allowed. 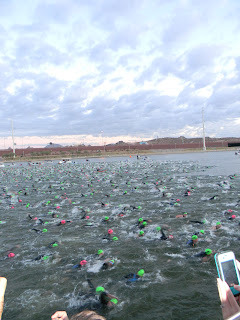 They also asked that we get in the water early near the transition area and swim down to the start line (roughly 200-300 yards). This isn’t a big deal, but the water was pretty darn cold. Spending an extra 10-15 minutes in it was not in my plan. As time drew near, I gave Debbie a hug and set off for the water. I tried to do as much dry land warm-up as I could while standing in a corral with several hundred other athletes and got in the water. I signed up for Ironman Arizona roughly one year ago and have been training for this race pretty steady for the last 10 months. I had a lot invested in the day, and I wanted it to go well. I mentally reviewed my goals for the day. These targets appear in order of importance for me. An Ironman is a long day and sometimes stuff happens. I know that if I focus on what I can control, I will have the best result I can that day, and whatever else happens will happen. All the competitors that day will be racing the same course with the same environmental conditions. I must rely on the fact that I have prepared myself well and focus on what I can control. 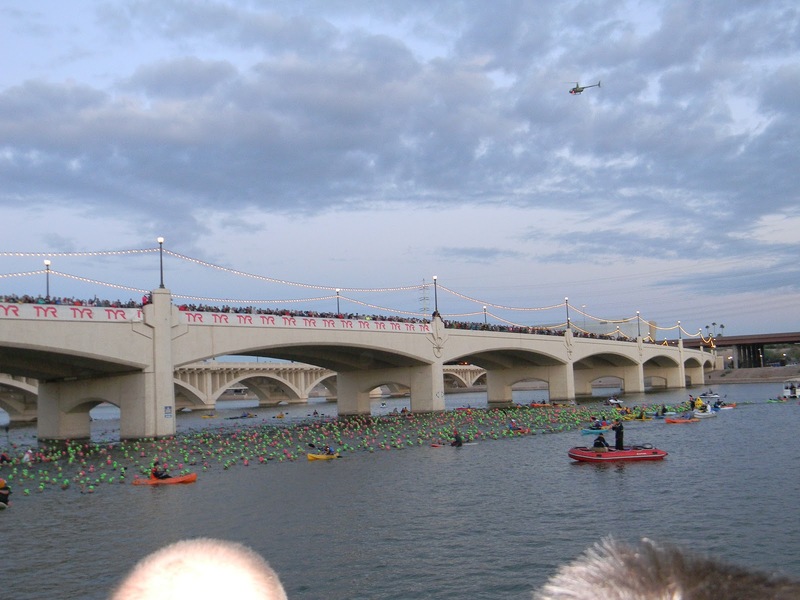 The swim course in Tempe is a rectangular counter clockwise swim that starts swimming east. You swim approximately 1 mile to the turn buoys and swim north for less than 100 yards to the second turn buoy. The way back to transition is a bit longer, but there is supposed to be some current assist (yeah right) on the way back. If you picture a clock in your mind, you could think about starting at the 6 and swimming counter clockwise to the 9 and it will give you a sense of the swim course. 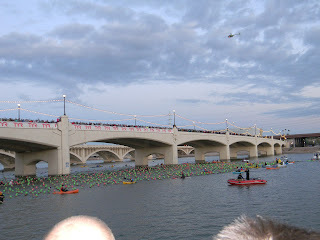 As the start of the swim comes closer, it is common for the front line to get compacted and “creep” past the start line. I wanted my starting position to be on the front line and roughly 1/3 of the way from the inside buoy to the outside. I thought this would give me the best chance for clear water and minimize excess swimming. As the gun went off (7:00am local time), it was absolute chaos. All the people that were treading water vertically now instantly become horizontal. This means the personal space you had is now occupied by three people and it is a fight to establish your own space again. Luckily for me, I played water polo in junior college and physical contact in the water doesn’t affect me like it does others. After roughly 200 yards of hard “head’s up” swimming through a mass of feet and elbows I was able to get into a rhythm. There were still people everywhere and it was an effort to maintain space for a smooth stroke. I was able to swim straight down the buoy line all the way out to the turn around with minimal sighting. The buoys were 50-75 yards apart so it was easy to swim from one to the next without getting too far off course. After about 15 minutes of swimming the crowd had thinned out and there was 5-10 yards between me and any other swimmer. I reached the first turn buoy in approximately 25 minutes. This is generally where another traffic jams presents itself, but there wasn’t even a lot of traffic at that point. The swim back did not have any significant traffic. I took advantage of a few opportunities to draft, but primarily swam by myself. 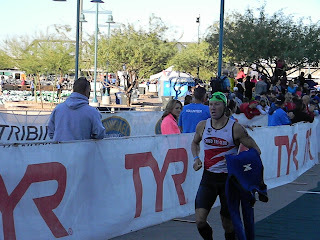 I finished the swim in 58:46 (9th in my age group) which is a good swim for me. My previous best (Florida) was 59:54 so I was already 1:08 ahead of my personal best. I was hoping for a swim closer to 55 minutes, but I made the conscious effort several times to take the swim easy. As I exited the swim, I began to realize how cold I actually was. 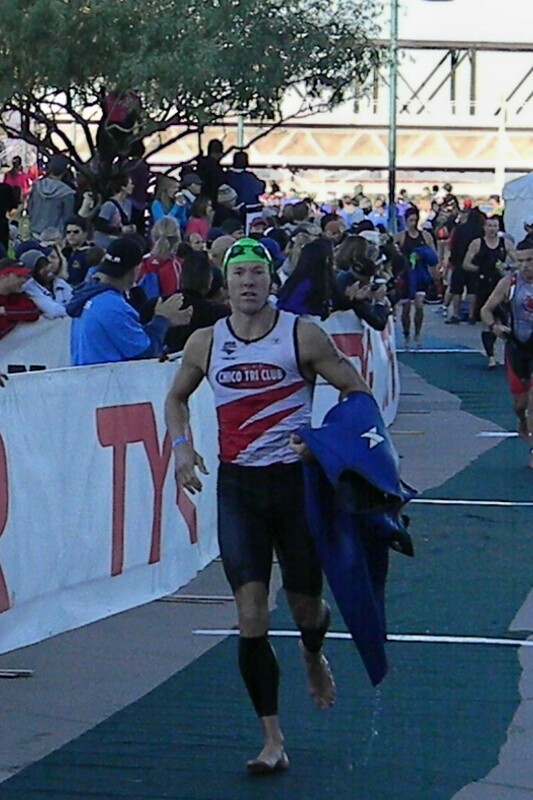 When I got out of the water, I made use of the wetsuit strippers and the cold really started to settle in as I attempted to run through transition. It felt as though my feet were frozen solid. I picked up my gear bag and made my way to the changing tent. The volunteer I met up with was awesome. He went so far as to roll up my arm warmers and help me put them on. I think he noticed my uncontrollable shivering and took pity on me. As I ran out of the changing tent, I ran through another group of volunteers that slathered me with sun block and went to find my bike. On the way to rack #14, another volunteer started running beside me. He offered to roll my bike to the start line. I was holding my bike shoes and this made the run through transition much easier. These volunteers were great! There was some congestion at the bike mount line, but I was able to navigate around most of it. I heard a collision and saw the pile-up behind me, but I made it out unscathed. The bike course at Tempe is 3 “out and back” laps of roughly 37.3 miles. The terrain is mostly flat with a slight pitch up toward the turnaround point. Each lap has approximately 500 feet of climbing, so it is considered one of the easier bike courses. My race plan was to ride each lap at a steady effort of 190 watts. Early on in the bike, I was trying to warm up so I was pushing a bit harder than originally planned. I started the bike course a few minutes after 8:00 and it took me the first hour to stop shivering. I finished the first lap in 1:41 with an average power output of 194 watts. I was passed several times on the first lap, but this was expected. In the second lap, I got passed a lot less. It seemed like the majority of the people that were going to pass me had done so by then. The wind picked up a bit but was only noticeable and I didn’t feel like it had any specific impact on the riding. 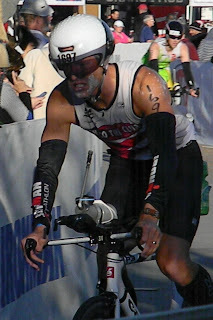 The second lap was completed in 1:45 and average watts of 191. By the time I reached the third lap, there was a significant amount of passing going on, but it was the other way around. 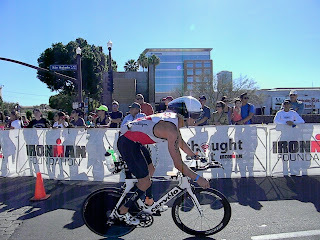 I was passing quite a few other age group athletes. As I was slightly over my “average” power target thusfar, I decided I would make sure I took the third lap easier so I would be able to run well after this effort. For whatever reason, I had a John Wayne like voice in my head saying “you gotta run a marathon after this, cowboy.” It may have been all the cactus covered desert I was riding through. I thought this would be a good opportunity to work on my passing technique. In Ironman racing, it is supposed to be an individual effort so you are not allowed to “draft” off other riders as this would be a significant energy savings. The rules say the “drafting” area is 7 meters (roughly 4 bike lengths). Once you enter the “draft zone” of the athlete in front of you, you have 25 seconds to pass that athlete. I was making a specific effort to ride up directly behind the next athlete and take advantage of as much of the draft as possible and “sling-shot” around each of the riders. Even if I got 1/10 of a second of a benefit every time I passed another person, it would add up over 37 miles. Ultimately, I finished the third lap in 1:44 with an average power of 178, so apparently something worked. My total bike time was 5:11 and I averaged 188 watts. This is roughly 30 minutes faster than my previous best in Florida and I was now 21st in my age group. This was faster than I had anticipated, but I was ready to get off the bike by this point and get started on the marathon. My nutrition/hydration on the bike went according to plan. I was able to drink 600 calories of EFS/CarboPro and 1500 calories of gel evenly spaced over the ride. I knew that it was going to warm up later in the day, so I did whatever I could to drink as much as possible. I refilled my water bottle at all but the first aide station and was able to stay comfortably hydrated throughout the day. In addition to the EFS/CarboPro mix, I estimate that I was able to drink 5-6 bottles over the course of the bike ride. Another volunteer took my bike after the dismount line and I went off to the transition tent. Being warm now, my second transition was much faster in general, but did include a pit stop and a total time of 2:44. I had my gels, Redbull, running belt and metronome in a separate bag I was able to carry with me on the run so I could “assemble” on the fly. 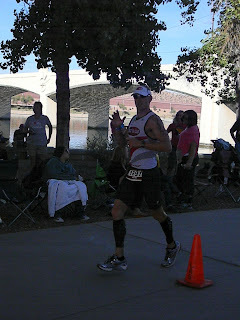 The run course in Tempe is 3 loops of an 8.6 mile, figure-8 shaped course. It is very spectator friendly and the weather was perfect. The high for the day was in the upper 70’s, and there was no wind to speak of. One downside of this course is there is virtually no shade. My plan on the run was to break down the run into 6 laps targeting an 8:15 pace and manage that by heart rate. The first 3 laps I would target a heart rate of 140 beats per minute (bpm). Laps 4 and 5 would be 145bpm and lap 6 would be whatever I had left. Part of the reason that I liked the 6 lap process is that it would make my time splits easy to track. If I stayed with 6 laps at 8:15 pace, each lap would be 36 minutes. I started the run at approximately 1:20 in the afternoon. If I was able to maintain a running pace of 8:15 per mile, for the entire marathon, this would get me a run split of 3 hours and 36 minutes. In order to make all my goals for the day I had to finish by 5:00 (10 hours), so I felt like I had a shot at it. My legs were feeling pretty good (given that I just rode 112 mile faster than I ever have before). The first lap seemed to go by in a flash. 34 minutes and 39 seconds with an average heart rate of 139bpm. I was ahead of schedule and my heart rate was right on track, so I thought I would try to slow down a little more to conserve energy. I saw Debbie as I completed the first of the 3 course loops. I felt great and started to wonder… how far under 10 hours could I go? 9:55? 9:50?? This is approximately when the wheels fell off. Around mile 9, my quads started hurting terribly and lost a lot of their power. This happened to me in Florida as well, but at the 20 mile mark. If I didn’t solve this problem quickly, this was going to be a much longer run than planned. I tried to focus on my run form and get my energy back. I also started walking aide stations around this time to give my legs an opportunity to recover. This lap was also the first time I felt light-headed during a race. I thought this was likely more a case of nutrition and calories than a “blazing fast” time. At the aide station at mile 10, a volunteer made me an offer I could not refuse. She held out one large chocolate chunk cookie (Costco style). I didn’t want to aggravate my stomach issue so I decided I would only eat half. Before I knew it, I had one bite of that cookie left so I held on to it until the next aide station and threw it away. That was potentially the best chocolate chip cookie I have ever eaten (that wasn’t made by my lovely wife). I finished my third lap in 40 minutes and 24 seconds with an average heart rate of 126. I realized the pain in my quads was not getting worse. I got comfortable with this level of pain and kept motoring on. Lap 4 was 37 minutes and 52 seconds with an average heart rate of 133. While my dream of sub 10 had evaporated by now, I felt like I was getting the wheels back on the machine. Just in time for me to really start feeling optimistic, lap 5 came around. In this lap, my “stable” level of pain went by the wayside and the pain increased substantially. I finished lap 5 in 38 minutes and 53 seconds with an average heart rate of 133bpm. Lap 6 is when I had planned on “giving it all I had.” Unfortunately, it had taken all I had since mile 9 to keep going and I started looking forward to the finish. 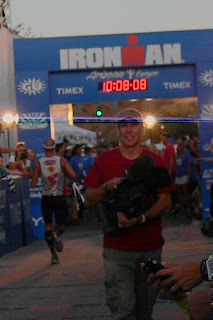 I was still thinking 10 hours and 10 minute total time was feasible, but I had to finish by 5:10pm. Seeing Debbie twice every lap was very encouraging. It means so much to me knowing that there is someone out there rooting for me. It was also very encouraging to know there were so many people following on-line from a distance. Thank you all for your support. When the going gets tough, it is nice to know there are people cheering you on. My plan was to count the people in my age group that I had passed through the last lap of the run. Unfortunately, I didn’t pass anyone I could tell was in my age group. As I was winding my way through the transition area heading toward the finish line, one guy came blazing by me. I noticed that he was in my age group, but there wasn’t anything I could do about it. I finished my run in 3:48:52. This was a 2 minute improvement over my Florida run, but was almost 13 minutes slower than I had hoped for. I was in 27th place in my age group, so that means I lost 6 places on the run. My overall time was 10:08:12. This was a 32 minute improvement over my previous best. It was also a relative improvement as I went up from 55th in my age group in Florida to 27th on the day. I have finally cracked the top 10%!! As I crossed the finish line, my mental and physical exhaustion caught up with me. I was caught by two medical volunteers and escorted to the medical tent. This was my first visit to a medical tent and I was not sure what to expect. Ultimately, they just kept me under supervision for about 15 minutes and let me go get some food. After I walked through the food area, picked up my chocolate milk and my pizza (yes, they were giving whole pizzas away to the finishers) Debbie and I decided it was time to go get my bike and gear. I hobbled back into the transition area and made my way to rack 14. As I walked down the aisle, I noticed a gap where the number 1697 was. This seemed odd to me, but I figured my bike must have been put in the wrong place by the guy who grabbed my bike at the second transition. I checked my rack and the racks all around it. The 6 month old bike I had agonized over purchasing was gone. Had someone already gotten into transition and somehow stolen my bike?? Anxiety would be the best description of the feeling I had, but also an odd sense of calm. I knew that if my bike was not found soon, I would be getting a new bike and someone else would be paying for it. We were instructed to check back after midnight when the race had officially “closed.” Debbie and I had planned on going back to see the last finishers around midnight anyway, so this wasn’t a big deal. I grabbed the rest of my transition gear and we walked back to the hotel. The finishing chute at the Ironman is a spectacle to behold. The race officially ends at 12:00 midnight, 17 hours after the start of the race. The folks that are finishing at this point are amazing. While they may not be going particularly fast, they are still moving after 16 hours of physical activity. Mike Reilly (the voice of Ironman) does a great job of keeping the crowd going (after 19+hours of talking, this guy is amazing too.) It is a small scale dance party. I say small scale because ½ the people in the stands are finishers of the race as well and they are not dancing. The other half of the people are still eagerly waiting to see their person finish. There was loud music, Mike pumping up the crowd, and even a little bit of YMCA thrown in to keep things interesting. We saw the oldest competitor on the day finish the race. He was 78 years old and finished around 16:30. This guy is literally twice my age. I hope I am that active and have that type of determination when I am his age. The last racer finished just before the cutoff and was assisted by Mike and two of the female pros that had finished hours before, but everyone was cheering her on. If you ever have the chance to watch the finish of an Ironman race, I highly recommend it. I checked back with the bike folks in transition and my bike was still nowhere to be found. They suggested we check with the transport people just in case. As it turns out, the bike numbers had come off my bike, but the transportation sticker stayed on, so they took it over to their “corral” for safe keeping (yeah!). It was a big improvement in time and my best absolute and relative performance to date. I pushed myself as hard as I could go and met all but my “ultimate” race goal for the day as I missed going sub 10 by 9 minutes. We went to the “roll-down” ceremony on Monday morning. 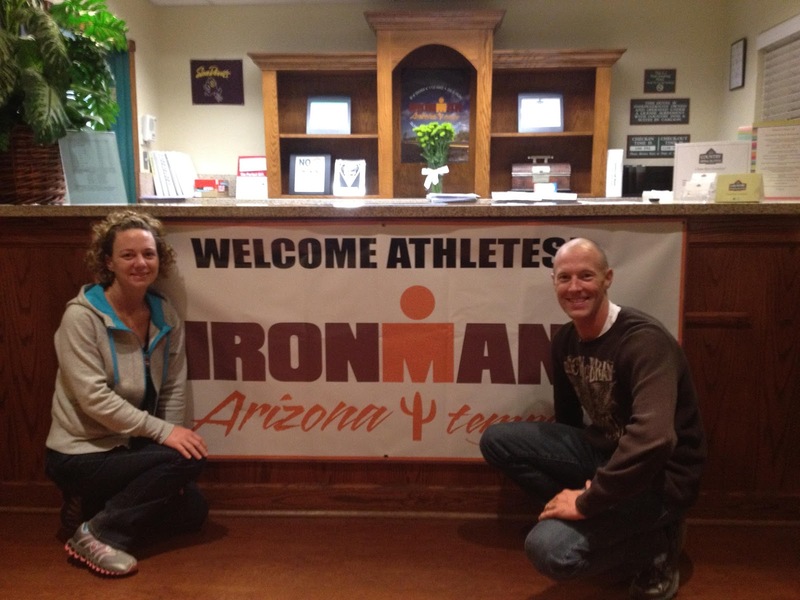 Ironman Arizona was allocated 50 Kona qualifying slots for 2,600 competitors. Each age group is assigned a certain number of these slots based on the demographics of who is signed up to race. The folks who have earned those spots can sign up for them before 10:00. If spots go “unclaimed” they will then “roll-down” to the next person in the age group. If the spot is not taken in the age group, it gets reallocated to the largest age group. In my age group there were 5 allocated spots (only 22 places to go…). The 5th place participant in my age group finished at 9:13. So even though I went 32 minutes faster than my previous best, I would have had to go another 55 minutes faster in order to win an allotted spot that day (ouch). All five allocated spots were claimed before 10:00, so there was not any “roll-down” in my age group. There was one spot that was not claimed in the 65-70 year old men that was reallocated to the largest age group (men 40-44). The guy that got the “roll-down” spot was in 7th place and was literally in tears after they called his name. He had missed the last allocated spot by less than 3 minutes. Interestingly enough, the guy behind him was only 10 seconds behind. My coach pointed out that this roll-down spot went to a guy who finished at 9:46 (over 30 minutes slower than the last spot in my age group). While I do not planning on sitting back and waiting until I turn 40, a 25 minute gap seems more reasonable. Many thanks to my coach - Jon Klingensmith @ Vitality Multisport, my on-line supporters, friends and family and the Chico Tri Club for all your support. Most of all, thanks to my lovely wife, Debbie. Without your love and support, I don’t know where I would be. Thank you for putting up with all of the training, grumpiness etc. Based on Jon’s direction, I have 2 weeks off from running, and 4 weeks off from anything structured. 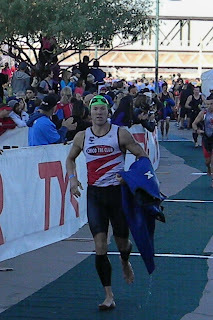 I plan on starting up again for IM Lake Tahoe at some point in late spring but will likely do some shorter races between now and then. This was a great season overall and I had a lot of fun training. I improved my relative performance at my preferred distance substantially. 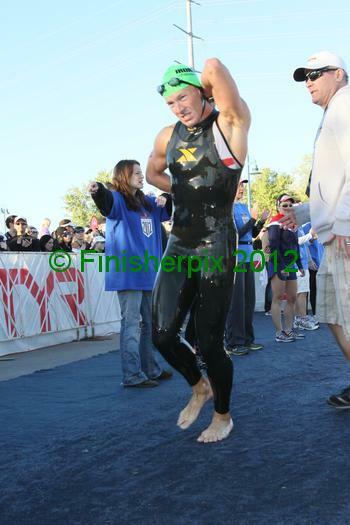 I brought home an age group win at Expedition Man Long course with a 2nd overall. I also got second place in my age group at the Granite Bay sprint triathlon (not even my distance). For now, it is “good-bye” to the fitness and hello to pie. Thanks again for enduring my on-line post-race therapy session. I hope you have found this entertaining and were able to learn something from it. If you would like to read more about “the dark side” of the results and some additional thoughts on qualifying for Kona.